While there is a strong and proven correlation between education and income, it’s harder to know whether there also is a link between religion and wealth. What we can say is that members of some religious groups – not to mention atheists and agnostics – on average have a higher household income than others and those in the richest religious groups also tend, on average, to be better educated than most Americans. 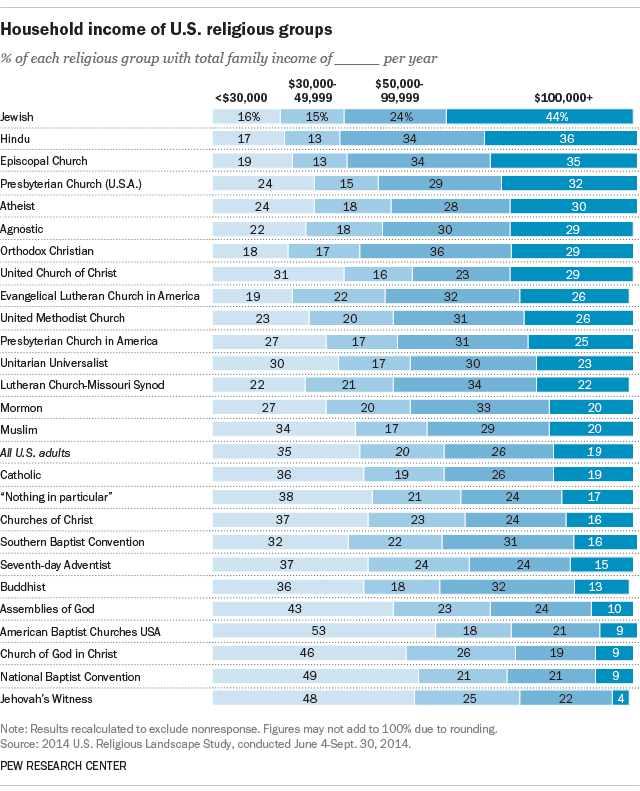 Some of the most financially successful religious groups – Jews, Hindus, Episcopalians, and Presbyterians – also are all among the nation’s most educated as well. These rankings, which come from our 2014 Religious Landscape Study, are based on the percentage of people within each religious group who reside in households with a yearly income of $100,000 or more. About four-in-ten Jews (44%) and roughly a third of Hindus (36%) and Episcopalians (35%) live in households with incomes of at least $100,000. Again, these groups also have high levels of educational attainment. For instance, nearly half of Hindu adults and almost one-third of Jewish adults hold postgraduate degrees. Indeed, in addition to education, other factors, such as age, race and ethnicity also are correlated with both religion and income. Members of three other mainline Protestant denominations – the Evangelical Lutheran Church in America, the Presbyterian Church (U.S.A.) and the United Methodist Church –also have high household income. So, too, do self-identified atheists and agnostics, which may call into question any link between high levels of religious belief and wealth. Members of all these groups also are more likely to be highly educated than the general population. Among those denominations with the lowest household income are two historically black churches, the National Baptist Convention (9% live in households with incomes of at least $100,000) and the Church of God in Christ (9%). Jehovah’s Witnesses also have low household income (4%). In all three of these groups, nearly half of all members have household incomes of less than $30,000 per year. Given that roughly one-in-five Americans identify as Catholic, it’s not surprising that the share of Catholics in the top income bracket (19%) is the same as the nation as a whole. Members of one of the country’s largest Protestant denominations, the Southern Baptist Convention, are only slightly less well off, with 16% in households making $100,000 or more.